Boy Scouts of America Troop 290 on Sunday held a court of honor for three new Eagle Scouts. The new Eagle Scouts are Joe Quinto, John Carter and Conor Kelly. The day started at the 11 a.m. Mass at St. Cecilia Church, where the Eagle Scouts carried the gifts to the altar. The court of honor ceremony and reception followed in the parish hall. 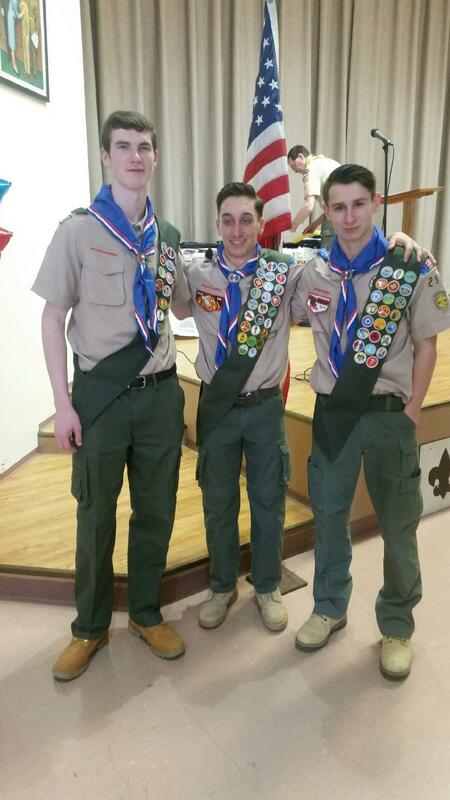 Quinto, Carter and Kelly are the 99th, 100th and 101st Eagle Scouts from Troop 290 since 1949. All three Eagle Scouts are high school seniors. Quinto attends Father Judge. Carter and Kelly attend Roman Catholic. Among those in attendance were Father Judge principal Peter Chapla; Ronald Pleis, chairman of the Boy Scouts Cradle of Liberty Roosevelt District; state Rep. Kevin Boyle, who presented the Eagle Scouts with citations; aides to City Councilman Brian O’Neill, U.S. Rep. Brendan Boyle and state Sen. Tina Tartaglione; and a representative from the Knights of Columbus. Don Campanile, of the Marine Corps League, presented the Eagle Scouts with Good Citizenship Awards. Cpl. John Loudenslager American Legion Post 366 also presented the Scouts with awards. 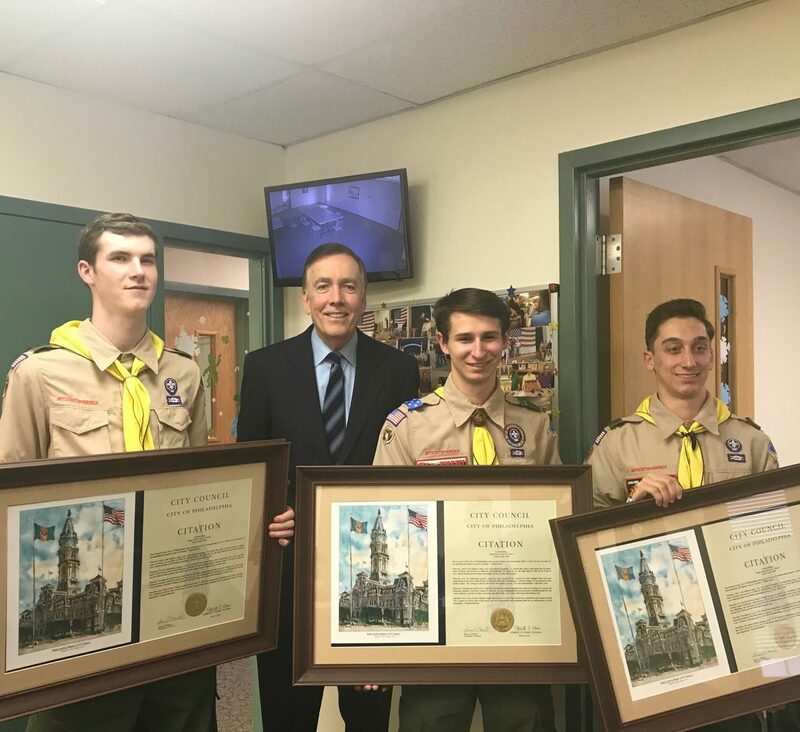 The Eagle Scouts visited O’Neill’s Fox Chase office on Thursday to receive their framed citations from the councilman. Former President George W. Bush mailed letters of congratulations to each new Eagle Scout. The Eagle Scouts received new American flags and presented their parents and grandparents with pins. The Scouts each presented two mentor pins. Quinto pinned Scoutmaster Chris Hirst and committee member Jim Rigney. Carter selected assistant Scoutmaster Chris Spoerl and his dad, Bernie. Kelly chose Hirst and assistant Scoutmaster Robert Grady.